The four main crusader armies left Europe around the appointed time in August 1096. 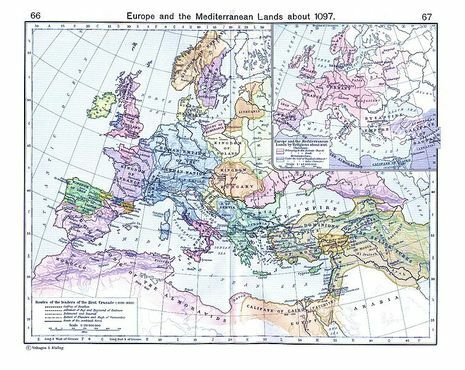 They took different paths to Constantinople and gathered outside its city walls between November 1096 and April 1097; Hugh of Vermandois arrived first, followed by Godfrey, Raymond, and Bohemond. This time Emperor Alexios was more prepared and there were fewer incidents of violence along the way. The size of the entire crusader army is difficult to estimate; various numbers were given by the eyewitnesses, and equally various estimates have been offered by modern historians. Crusader military historian David Nicolle considers the armies to have consisted of about 30,000-35,000 crusaders, including 5,000 cavalry. Raymond had the largest contingent of about 8,500 infantry and 1,200 cavalry. Robert Guiscard, from Latin Viscardus and Old French Viscart, often rendered the Resourceful, the Cunning, the Wily, or the Fox, (c. 1015 – 1085) was a Norman adventurer conspicuous in the conquest of southern Italy and Sicily. 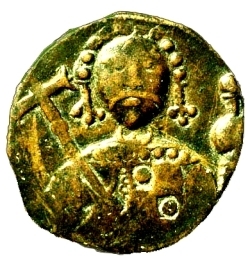 He was Count (1057-1059) and then Duke (1059-1085) of Apulia and Calabria after his brother Humphrey's death.